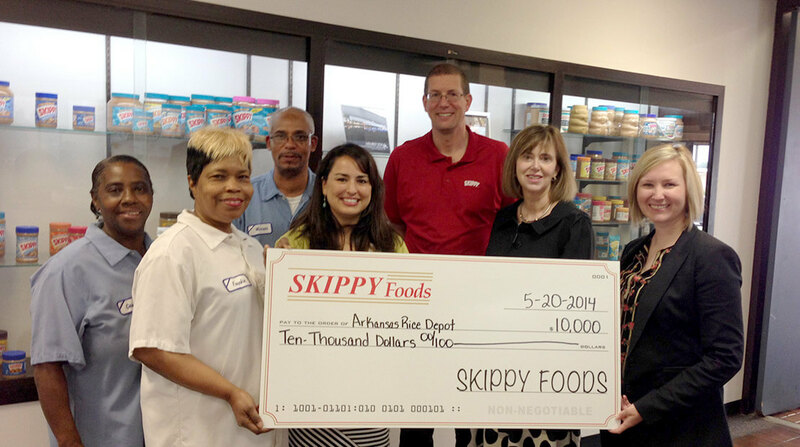 Skippy Foods, the local manufacturing plant owned by Hormel Foods Corporation (NYSE: HRL), today announced a donation of $10,000 to the Arkansas Rice Depot to fight hunger in the Little Rock community. In addition to the $10,000 donation, Skippy Foods employees will be hosting a food drive and collecting team member donations for the organization. For the fourth consecutive year, Hormel Foods is giving funds to U.S. manufacturing facilities to share with nonprofits in their respective communities to fight hunger. In 2013, Hormel Foods donated $220,000 to local hunger relief organizations in more than 20 U.S. communities where it has manufacturing facilities. In 2014, the company will provide 39 plant locations with funds to help local organizations fight the hunger needs specific to each community. Arkansas Rice Depot, the only statewide food bank in Arkansas, serves all 75 Arkansas counties.